A migrant rescue vessel captain accused of steering an unregistered boat has been granted bail by a Maltese court. MV Lifeline captain Claus Peter Reisch, a 57-year old German national, was arraigned under summons five days after the vessel docked at Boiler Wharf in Senglea. The ship was carrying 233 migrants it had rescued off Libya. Eight EU member states as well as Norway have agreed to an ad hoc plan to distribute the migrants among themselves. Mr Reisch stands accused of having steered the ship within Maltese territorial waters without the necessary registration and licence. In a crowded courtroom packed with members of the local and foreign press, the captain sat at the dock, assisted by a German interpreter, as three Maltese lawyers took up his defence. At the very start of the sitting, a fourth lawyer, Sicilian Corrado Giuliano, representing Mr Reisch's NGO, asked for proceedings be conducted in English. That request was turned down, with magistrate Joseph Mifsud pointing out that the normal procedure was in Maltese and that an interpreter was being provided to assist the accused. Inspector Mario Haber took the witness stand explained how local authorities had known about the Lifeline since June 21, when it was involved in migrant rescues in Libyan territorial waters. The day after the vessel docked in Malta, the police had spoken to Mr Reisch. He told them he had been involved in two main rescue operations and had requested safe harbour, with no preference between Malta and Italy. Inspector Haber said that Dutch authorities had confirmed that the Lifeline was not registered under the Dutch flag. The captain had given police an e-mail issued by the Dutch Economic Ministry stating they knew of the Lifeline and its salvage operation. 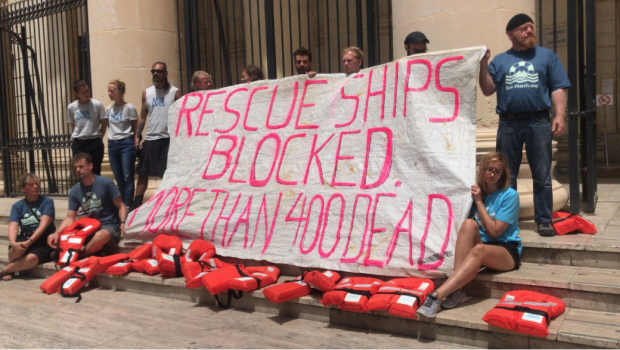 However, the Dutch registry of shipping told Transport Malta that the vessel was not registered under the Dutch flag, but merely with a yacht club. 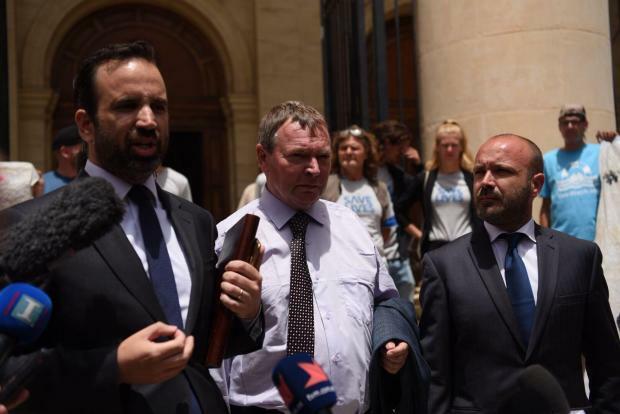 Fielding questions by defence team lawyer Cedric Mifsud, Inspector Haber confirmed he had not contacted the Dutch authorities directly but had spoken to Transport Malta, their local counterparts. Inspector Haber also declared he had checked the vessel's registration status as it stood today, pointing out there had been no need to check how it had been registered before the certificate issued by the Dutch authorities. The inspector confirmed that the police had not investigated the captain on charges of human trafficking or human smuggling. “So what triggered your investigation?” Dr Mifsud asked. “There is currently a focus on such vessels. Is that why criminal action was taken?” Dr Mifsud insisted, prompting the magistrate to ask whether police were also investigating the case of a small boat carrying nine asylum seekers that sailed into Marsascala on Sunday. “Yes. There is currently an ongoing procedure. The same procedure is always adopted,” Inspector Haber confirmed. 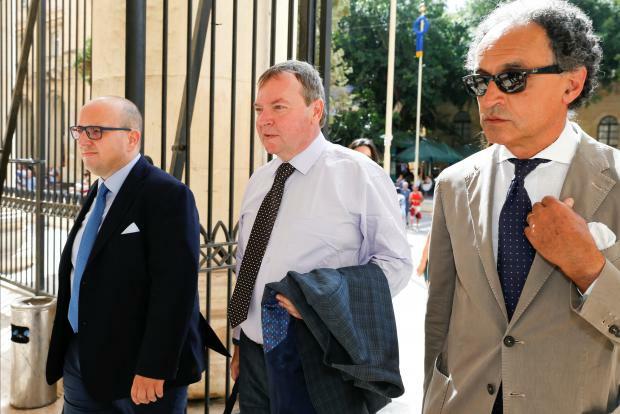 “However, in this case you proceeded on ‘detto del detto’ (hearsay)”, Dr Mifsud continued, noting that police had relied on Transport Malta's account rather than speaking to Dutch authorities directly. “You should have done your work well rather than issue charges under pressure of [Italian deputy Prime Minister Matteo] Salvini," Dr Mifsud added. That prompted the inspector to retort that the captain had first presented a mere photocopy of the ship’s certificate without even knowing that the original was locked away on board the vessel. Inspector Haber presented a copy of the crew list, drawn up by the captain himself, and a copy of the captain’s licence, which only allowed him to navigate power-driven or sailing yachts in coastal waters not beyond 30 nautical miles. “This yacht had no registration, pleasure boat or otherwise,” was the prosecution's final word. Magistrate Mifsud said that since the Lifeline was now a court exhibit, only the captain and a skeleton crew, needed to man the vessel, were to be allowed on board from now on. Prosectors’ request to have a surveyor draw up a report on the ship’s condition and contents drew objections from defence lawyers, who said the report would add unnecessary costs. “We are not ISIS,” Dr Mifsud quipped. As the sitting drew to a close, magistrate Mifsud granted the captain bail against a personal guarantee of €10,000, an order to appear for all sittings and to sign the bail book once a week. Magistrate Mifsud adjourned the case to Thursday. Lawyers Gianluca Cappitta and Neil Falzon were also defence counsel. Inspector Daryl Borg also prosecuted. Protesters gathered outside the courts, defending the rights of NGOs to support rescue efforts. 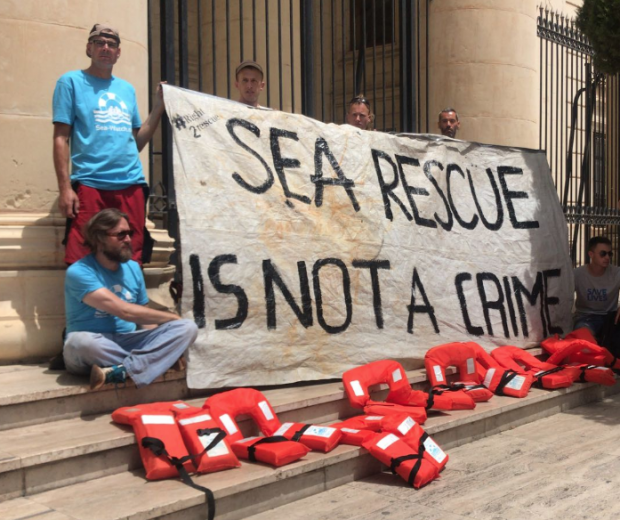 A group of NGOs issued a statement condemning the Maltese government's decision to close the ports to their ships, saying that the consequences of this measure were potentially fatal. The organisations said that according to a UNHCR report, the death rate among those crossing from Libya increased to one of every 14 people in the first three months of 2018, compared to one of every 29 for the same period in 2017. NGOs accounted for 26 per cent of all rescues, saving the lives of thousands.